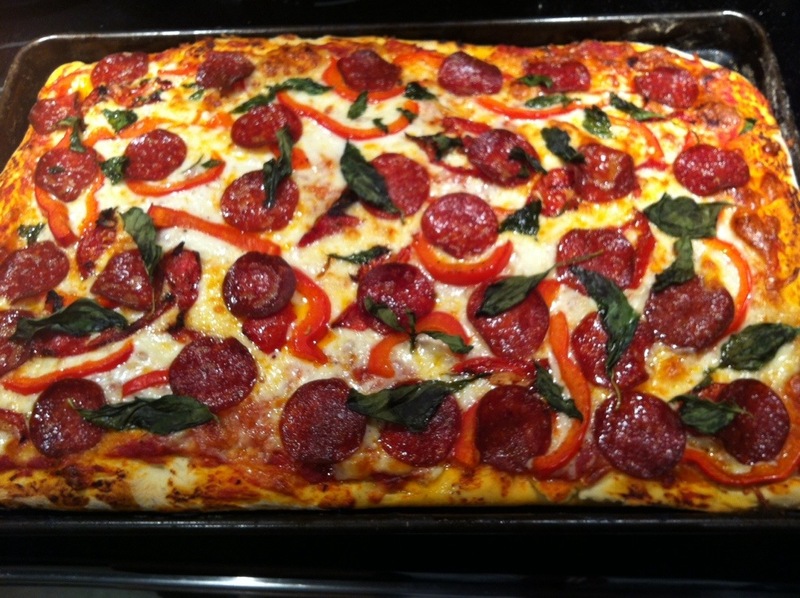 I went to wine tasting years ago and I tried a slice of Sicilian pizza and I loved it. 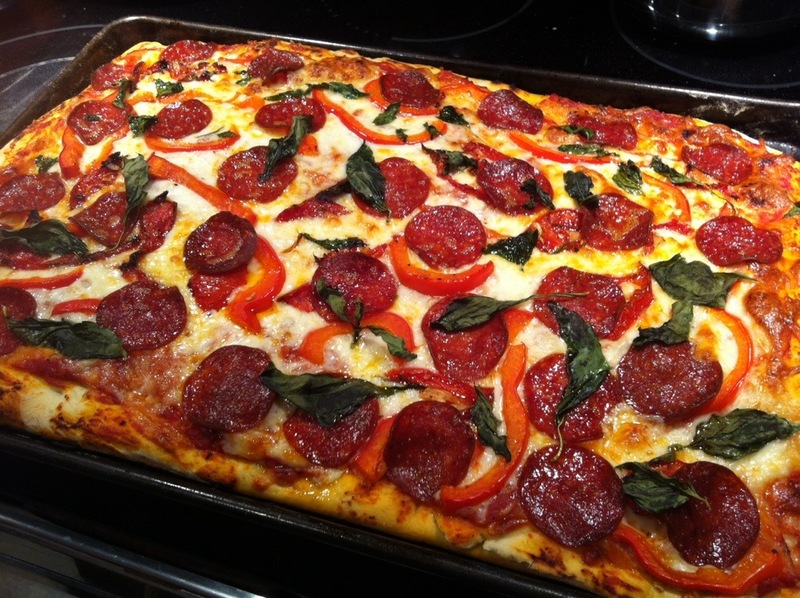 Sicilian pizza dough is thick and chewey, simple toppings of cheese, a vegetable and herbs, maybe slices of sausage or pepperoni. At the wine tasting I asked the guy about the pizza and then I did some research and then I started to make my own pizza with various toppings and this was the combination I liked most. I also brought this version to my workplace potluck. Put the warm water in a bowl with the brown sugar and dissolve, add the yeast, allow it to sit for about ten minutes in order for the yeast to foam. In another large bowl combine the flour, salt and flax seeds and mix. Make a well in the flour add olive oil and stir in the foamed yeast water, mix well and turn dough on a floured surface and begin kneading for about 7-10 minutes until a soft dough forms. Put dough in another oiled bowl and cover with plastic wrap and a tea towel, let it rise for at least one hour. Punch down dough and allow to sit covered again while you prepare the toppings. In a small pot warm a bit of olive oil and sauté the garlic add the passata, rosemary, fennel seeds and simmer on low heat for about ten minutes, remove from heat and allow sauce to cool down before spreading on dough. Preheats oven at 450*. Stretch dough out to fit a 12 x 20″ cookie sheet using a rolling pin, oil cookie sheet and dust with corn meal. Lay out dough on cookie sheet and using your fingers, try to develop a thicker edge. Spoon sauce all over pizza dough, add basil and cheese, top off with the peppers, tomato slices and pepperoni. Put pizza in oven and use convection if available. Cook pizza for about 18-25 minutes. Ovens vary so check under crust after 15 minutes for doness. I hope you try this one out and again please comment below. Tomatoes are in season right now, as everyone is getting the last ones off their garden vines. Bruschetta is awesome and very good for you, tomatoes, garlic, olive oil… WOW simply amazing, sweet, acidic tomato, garlic and earthy fruity olive oil and herbs inside whole grain bread and maybe a grating of cheese. You could also throw in same mescaline mix or salad greens. Cut tomatoes in half and then slice or dice as to your preference, put in a bowl with remaining ingredients except for bread and cheese, mix well. Spoon tomato mixture on top of a slice of bread or in between buns open face sandwich, grate cheese on top and toast sandwiches in oven for 5 minutes. I’ve been making Saganaki cheese at home since I was about 12 years old but it never occurred to me that I could put the cheese in a sandwich until now. 1lb Kefalograviera cheese, you could substitute, haloumi cheese, kasseri or kefalotiri cheese. These cheeses can be found at Greek stores, Nicastro’s in Ottawa and you can actually find a cheese named saganaki already portioned out ready to fry at Sobeys. Slice tomato in slices, heat an oven on broil and place the red pepper on a piece of foil 10cm away from the broiler or grill the pepper. Cut the cheese in 4 slices approx. 7cm square by 5mm thick. Slice bread for sandwiches or cut buns in half and brush with olive oil, lightly toast bread in broiler or grill. When pepper gets charred remove from broiler or grill and wrap in foil for a few minutes to cool. Unwrap the foil and peep off the charred skin and discard, chop the pepper in slices. Wet the cheese with water and dust cheese with some flour. Heat a non stick frying pan on medium high heat add a tablespoon of olive oil to pan and then add the cheese and fry, do not crowd frying pan, fry two slices of cheese at a time if pan is small. 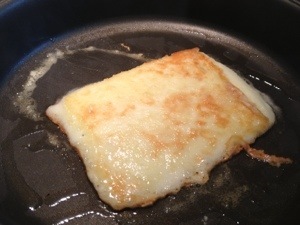 After two minutes flip cheese and fry an additional two minutes, remove cheese from pan and keep warm. 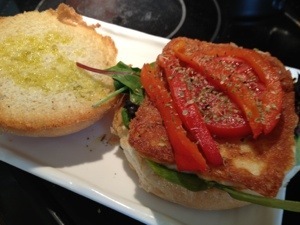 Arrange the mixed greens on toasted bread and top with the fried cheese, then top with tomato slices and roasted pepper slices, sprinkle dried oregano and fresh cracked pepper on top and put the other piece of bread on top and serve. I prefer to keep this sandwich meatless as I really want the cheese to stand out. 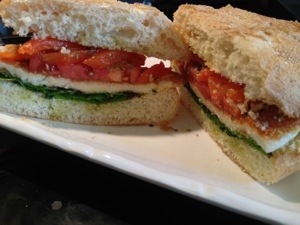 Other ideas to include inside sandwich would be olive paste, steamed kale or Swiss chard, pesto, zucchini slices, roasted eggplant and even cucumber.